Returned from the pampas as new wo/men who conquered the river, we get one night of rest in town to prepare for the march into the Amazon jungle the next day. We came across a hole in the wall restaurant and got ourselves more than enough food for five people, all for $8 usd. Cha-ching! Then we went to the Moskkito Pub with some free drink tickets given by our tour company, Max Adventures, and had some of the best [insert drink name that I forgot here] ever!! It’s like a mojito with a twist. Cha-ching again! Yummy food and yummy drinks, we’re now ready for the jungle. A good night’s rest is a beautiful thing I had come to appreciate very much of. In the morning we were back at Max Adventures again to repack our backpacks and put unnecessary things in the lockers. It was also time to say goodbye to our dear friend Annie who was flying to La Paz and then back to DC, which means we were one man down against the jungle with only a total of four left. The search for fresh juice and salteñas ensued for breakfast and we soon met our guide, Miguel, and our cook, Ranaldo. Born and raised in the jungle, we later learned that Miguel’s the person you want by your side in the forest, where you can get injured or die from so many things that appear harmless. 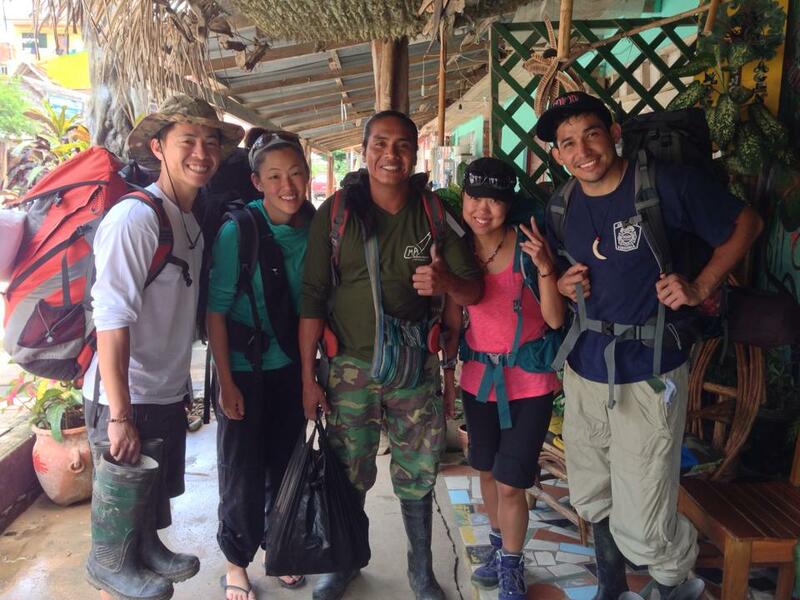 Jungle survivors, a fob, and our guide. With all our belongings and boots, we said bye to Annie once more and departed for the dock five minutes away. The boat made a pit stop at the Madidi park’s admin station for our check in and ticket purchase, then we were officially into the jungle on the Beni river. About 20 minutes up river was a ranger station where we made our second stop. The ranger explained to us (while Joaquin translated the whole thing) the geography of the park and the different regions and communities. All the dark green areas are “virgin forest” with no permanent inhabitants or human entrenchment. The boat we took was much more similar to the one I took in the Amazon by Leticia and Peru. 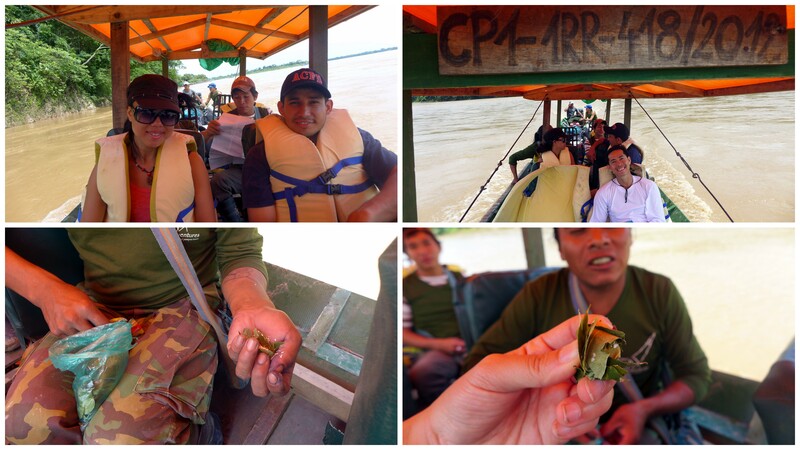 On the way to the campsite, Miguel showed us how to chew-mix-chew coca leaves to enhance its flavors. A giant wad of coca leaf mixed with some (baking soda?) and it tastes sweet like candy! Then he showed us these mini coconut like seed pods where you can eat the center and extract something almost identical to coconut oil from it. When we put our eyes back onto the water to see the fork road up ahead, we saw giant pieces of land plus trees slide into the river, as if it’s a piece of cake. Just like that, the river grew wider. 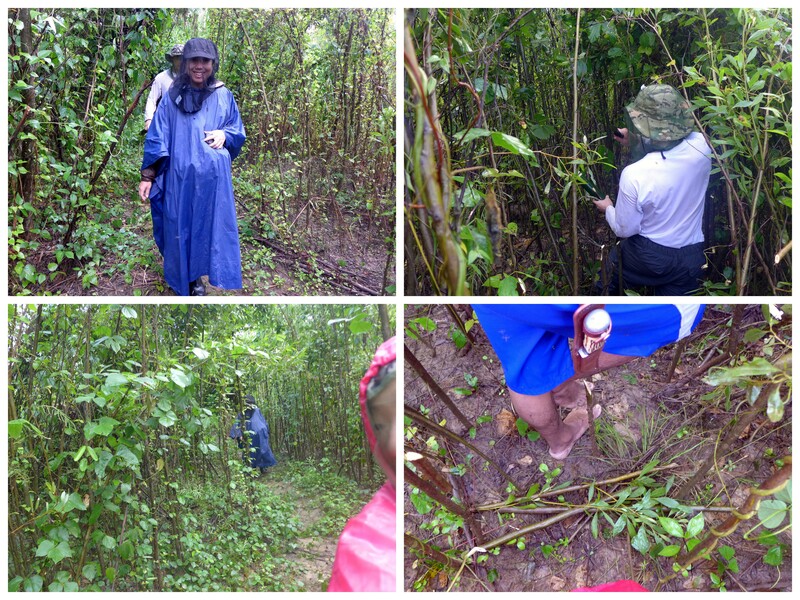 At the campsite, we put our bags down and went for a stroll in the banana field/jungle. What’s the first thing we did? Accessorize! and the second? 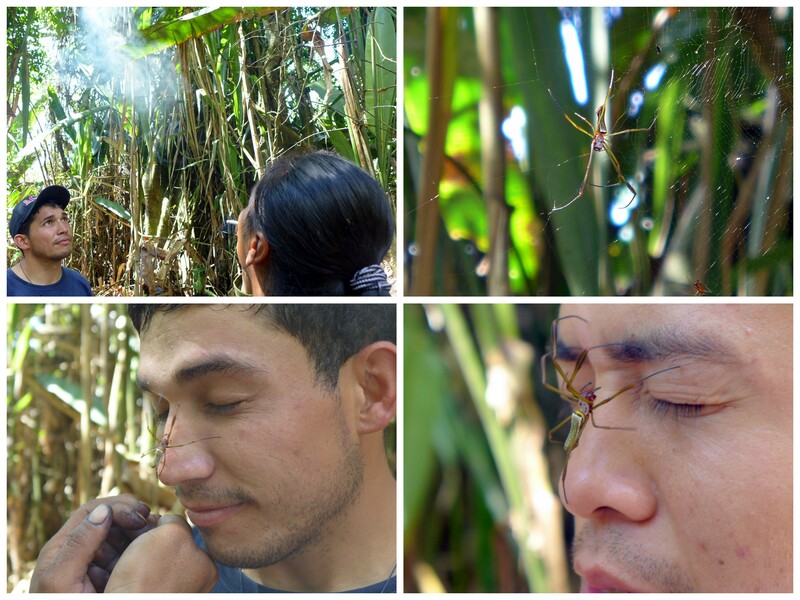 Put poisonous spider on faces. It’s jungle play. First Miguel smoked the heck out of the spider with a cigarette (what does that say about your lungs, smokers!!!) and semi-paralyze it. Then the spider won’t bite as it tumbles down the boys’ faces. Sylvie (or someone) almost walked into the web. That ‘thing’ had some serious fangs!! At the beginning the dirt trail was very visible. But as we get deeper into the woods, the vegetation got more dense and the trail shrunk down to merely shorter vegetations. On top of that, the rain created muddy puddles everywhere. “Preggo” Sylvie. Tu trying to chop his way through the bamboos. Miguel and his bare feet. Miguel taught us a lot about the jungle plants. My favorite was the Ajo Ajo tree. It looks just like a regular tree but when scratched, the bark comes off like chopped garlic and it smells and tastes just like garlic as well! A-mazing. I ate it and rubbed it all over my hand because it keeps the mosquitoes away. There were also some edible roots, nuts and jungle mangoes. A berry that they use as soap. The rubber tree the leaks rubber. A plant that clears your nostril when scratched then sniffed. He talked about more but due to the rain, I kept the poncho on and the camera in. A quick bath after the trek by the riverbank. The two long light paths were from that insect that may kill a person if ingested. After that short stargazing break, Miguel asked if we wanted to do a night trek in the jungle. At first Sylvie and I were hesitant but it’s supposed to be a short hike so we joined. Miguel got another guy to be at the end of the line for security reasons. Jungle at night is no joke, even more deadly creatures awake, hungry for a meal. If we turned all the flashlights off, we cannot see another in front of us, not even our own hands. Yet if I look up into the sky, I can make out the stars. A leaf butterfly. A butterfly that looks just like a leaf. WTHHHH!! Miguel signals when something is nearby by turning off his flashlight. A few moments later, we heard heavy heaving and stamping sound. He said it was a tapir close by and he ran away. Darn, only if I had some night vision goggles! Without the help of technology, Miguel said he was taught by his teacher on how to walk in complete darkness. Tu wanted to see for himself, so walk in the pitch black jungle he did, and he took Tu for a spin in the dark too. By this point Sylvie and I were practically sleep walking. Been up since 7 AM and was so tired and the jungle was so dark that I might as well keep my eyes closed! Took a brief 5 minute nap while we sat on a tree trunk then decided we should head back. I went straight to bed after we got back to the campsite but Joaquin and Tu stayed up with Miguel to catch up on all the missing years. In the morning I woke up to a bladder waiting to burst, and so I had to get out of bed. Apparently the boys got so into talking, others joined and pulled out some of their homemade happy juice. They sipped and talked until 3 AM, then slept and woke up again at 5:30 AM. That’s not even enough time to get a hangover!! It all started when the founder of this Max Adventure guide company, Lazaro, who is now in his seventies and well, went on a crazy trek to find the woman of his dreams. He trekked from Peru to Brazil and found his true love and brought her back. Obviously they made many little ones who continued the jungle legacy. His ability to guide was recognized globally when he saved a Israeli boy who was lost in the jungle for weeks. Born and raised in the jungle, Miguel was an kickboxer until he injured his knee. He prefers the jungle and have once been on a 40 day trek through the Amazon, a customized trip at the request of a tourist. They lived off the forest like wild indians. There was a giant tree chopped down that lays in the middle of the path to our campsite. They say that the tree is powerful and spiritual, but it had to be chopped down because one of the cook was having terrible nightmares. They say it’s because his mind and heart were not one, that’s why the tree affects him so. Yes they worship her like monsters worship Lady Gaga. Mother Earth (Pachamama) is everything to the people who relies on her to survive. Sometimes we forget that we’re not so different. We too must rely on her to survive. Breakfast was a true feast. Pancakes, fresh fruits, bread, the works. Then we set out to catch some Amazon river fish. Miguel gave us our fishing “blocks” fashioned with a metal hook. He showed us a twig with spikes that the indigenous used as fishing hooks before the metal. Old versus new. Fishing hooks from two different eras. From a small stream, Miguel gave us bits of bread as bait. He caught a small fish right away which was then used as bait. I really liked fishing without a pole. There’s something about holding the line in your hand that gives a direct connection to the water and you feel every tug and nibble. Three bait fish were caught in the first section of the stream. Then Miguel took us to a deeper section of the river for the big game. While we were fishing there were at least 2 dozen of mosquitoes flying around each one of us at any given time. It was better to just let them be than to fight them. It was tough because you don’t want to put on repellent then touch the bait because then the fish won’t bite. Got so many bites on my hands it was a surprise that I was able to bend my fingers still. Patience and DEET free fingers paid off when I fetched a Amazon “salmon”! And then I lost my hook to a tree. Boo. Shortly after, Tu caught a super aggressive fish that refused to die. He smacked and stepped on the fish’s head more than three times and each time the fish would try to fight back. It had almost piraña looking teeth on an almost smiling face. I caught the friendly fish, Tu got the aggressive fish, and Sylvie caught…Joaquin! 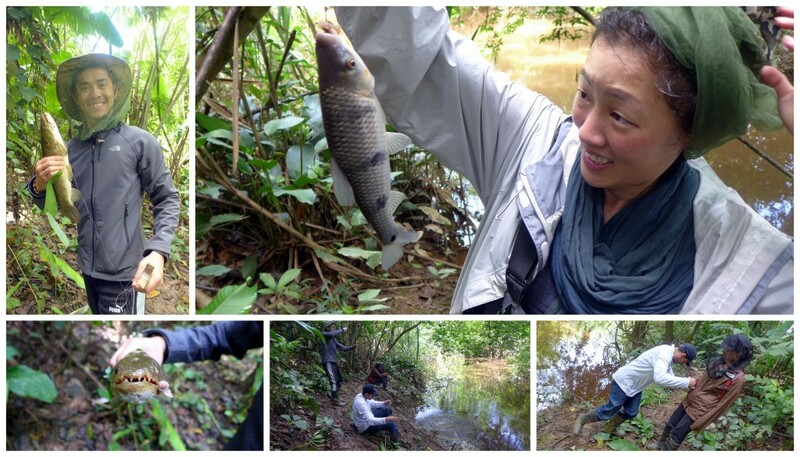 With lunch in hand, we head back to the campsite where Miguel said he can cook the fish in bamboo *mouth waters*! Original Amazon forest flavors. Both fish were placed inside the bamboo and slowly roasted over fire. I’m not even sure if he used any salt but it tasted so fresh and tender with a hint of bamboo. Que rico! 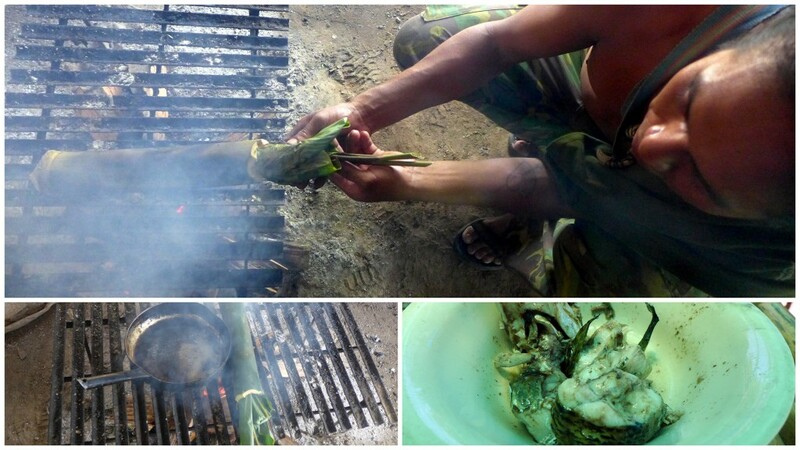 Fish in bamboo over fire…must try this when I get back! We rested and goofed off for a bit before the final goodbye group photo. It was sad to leave the jungle and I wished we had more time there. We actually thought about staying for another day but there’s no way to communicate to the office to change our flight. So leave we must. Group farewell and Miguel with his “my bottoms are clean” pose. The boat got back to dock and we were able to get a shower at the Max Adventure’s office. Had a few hours to kill before the flight and within those few hours, Tu almost got wedded off to a girl from Rurrenabaque (a story he may share if asked lol). The ride to the airport was dodgy to say the least. 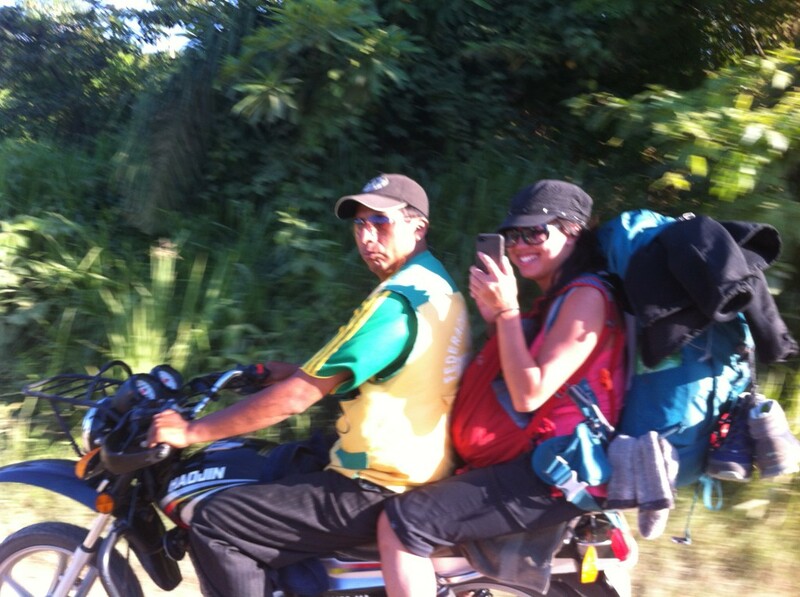 We each had 20-30 lbs worth of backpack on us and a motor-taxi was a questionable way of transport. Nevertheless, we did not tip the scale and lived to die another day. Ummm eyes on the road, anyone?? Take vitamin B pills daily for 2-3 weeks prior to the Amazon, or you can get an injection two days before. Mosquitoes don’t like the scent of Vitamin B and will stay away. Spray your behind before going down. The mosquitoes are quick and they know when you’re at your weakest! 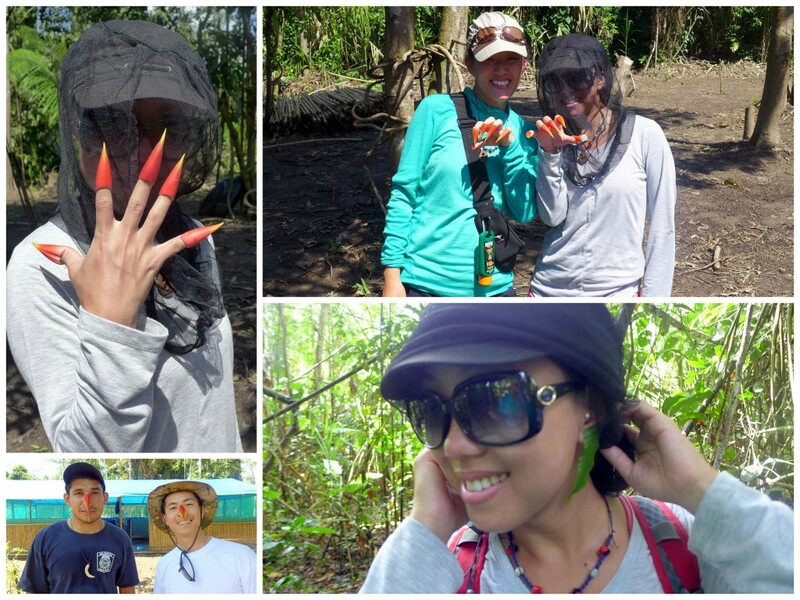 Jungle tour with Max Adventure: $800 Bolivianos pp. Up to 3 days / 2 nights. 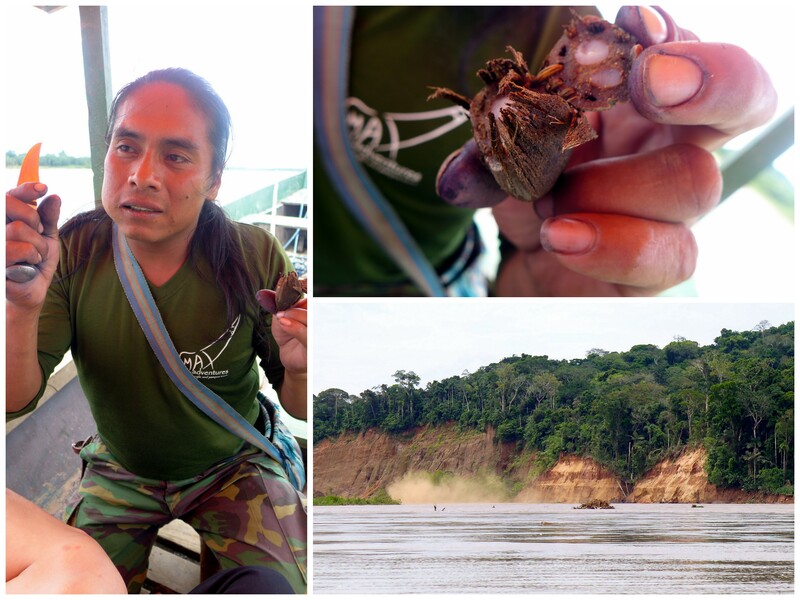 Previous story Pampas, Rurrenabaque – Amazon Round 2!